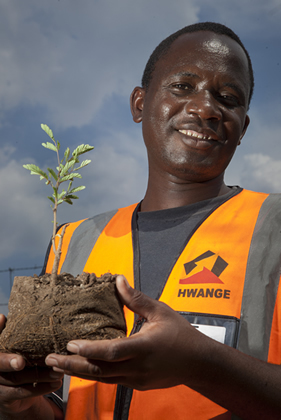 Hwange Colliery is committed to the principle of integrated environmental management and continues to invest time and funds in striving for greater harmony between its operations and the ecologically sensitive environment. Of the two mining methods, Opencast mining is the most destructive to the environment in that to get access to the coal seam below the surface, the land is stripped bare of its vegetation. The mixture of fireclay, carbonaceous mudstones and shales found in the overburden material encourages the process of spontaneous combustion. To correct this Hwange Colliery has in place a rehabilitation program which involves covering burning spoil piles with supplementary stripping material to suppress the fires and starve them of oxygen. This material is then leveled and contoured before agricultural lime and fertilizers are added. Indigenous trees and grasses are planted at the start of the rainy season to revegetate the land and thus encourage fauna to return to their natural habitat. The principle of developing self-sustaining eco-systems is followed.